I always enjoyed Cole Sprouse as Riverdale’s Jughead, so I found it intriguing to see him as a co-lead in this Fault in our Stars-esque rip off. It is not cancer this time that is bringing the two teens together. It is cystic fibrosis (what they refer to as CF the whole film). These two are both in the hospital at the same time and they strike up a connection. Stella (Haley Lu Richardson) is a control freak and can’t stand by while angsty teen Will (Cole Sprouse) refuses his treatment regimens while sketching everything around him. They spend time together, despite not being allowed to come withing five feet (the film consistently says 6 feet, which was odd considering the movie title) of each other in fear that they would give each other the infection of their type of CF. The closer they become, the more they are willing to flaunt the rules and place themselves in jeopardy. While both Richardson and Sprouse are charming and easy to like, the film does not provide much for them outside of the typical cliches found in these dying teenage film genre. The film does no favor to either of their lead actors as the situations become more unlikely as the film progresses and the plot is not developed past the surface level of manipulative tear-jerker. I would say that both Richardson and Sprouse are stars in the making. I was thinking about what Marvel character they could play. I thought Sprouse would be great as Bobby Drake, aka Iceman in the upcoming X-men-in-the-MCU discussions and I considered Richardson perfect for Kitty Pryde. You can tell that I was not as invested in the movie’s story since my mind was wandering to the MCU. It is not a bad movie and there will be a ton of teenage girls who will love this movie, but the melodrama is at a high pitched level for me. 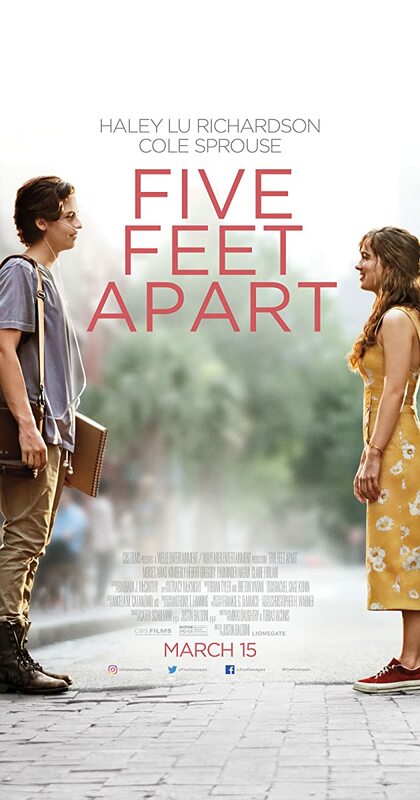 Charismatic young future stars aside, Five Feet Apart is just another forgettable dead teen film.